Guest blogger Judy Dixey has been at it again! Two masterpieces in one week – comic and sublime! London has a wealth of excellent opera and the audience is lapping it up — even in obscure places. I went to a brilliant adaptation of The Barber of Seville in a pub theatre, and a stark, sublime production of Monteverdi’s Orfeo in a former railway repair shed, all within a week. The Kings Head in Islington has hosted a huge range of stunning, challenging theatrical productions over the last 30 years and this was no exception. 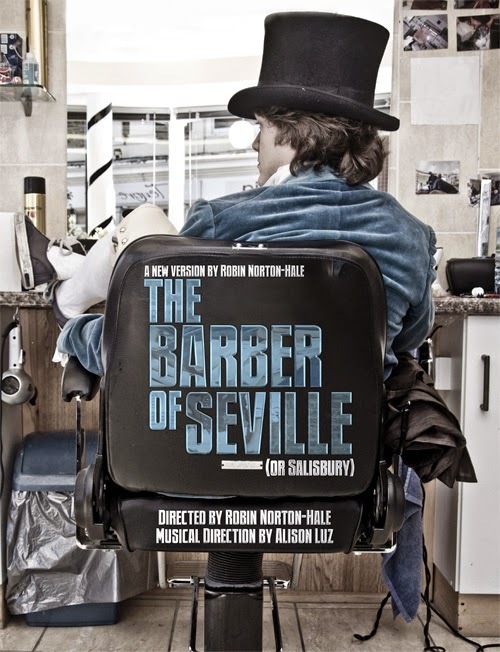 Opera Up Close presented the Barber, transferred to Salisbury, which is absolutely fine for a British audience who know that Salisbury was a backwater at the end of the 1700s, beginning of the 1800s, i.e., the Regency period. Bath was THE place to be, and Rosina and her guardian are just returned home from a visit to Bath, where Rosina and the count, a noted rake, had somehow met. Singing great, piano reduction excellent, production sharp, translation witty — what more can you want? We were really up close and personal, and the singer/actors gave it their all. The moment of revelation when Almaviva is unmasked and Rosina realizes she’s hooked a Count — WOW! Her expression said it all — she loved him before, but now she really loves him! Enormous fun. And then the Royal Opera House/Roundhouse, live-streamed on 21st January. The Roundhouse for opera? Why not? It’s a massive circular building, topped by a broad, conical roof supported by 24 columns and cast iron girders, built in the 1840s to function as a railway repair shed. Inside, it’s stark, and atmospheric. It became a performing arts venue in the 1970s and has had an extraordinary career. I think this is the first foray into opera and, boy did it work brilliantly, due to the imagination and verve of the entire production team and the participants. In terms of audience, it brought in the usual opera audience but additionally many people really new to opera – perhaps because of the venue but also because of the engagement of a number of young people. There was a balcony for the great and good to watch proceedings (perhaps they were the Duke and Duchess of Mantua, where the piece had its first performance? ); from there, at one point, they came down as dei ex machina (Pluto and Persephone); but otherwise, the set was formed by young dancers from East London Dance who became, most effectively, the rolling River Styx, the gates to the underworld, the silent chorus – what a coup. We are getting used to minimal sets, and in this venue, it certainly works. As for the performances, another wow. The Roundhouse itself holds 20 times as many people as the Kings Head but because of its arena-like auditorium, we were close to the stage, sound was excellent and every note worth hearing. I don’t remember appreciating the intensity of Orfeo’s appeal to Charon to let him across the Styx and into the underworld as it is rendered so thrillingly by virtuosic repeated stressed notes, heard here far more than through the rest of the opera. Music and meaning matching — as should happen in opera. Even if you don’t know the story, you can tell from the opening notes that it is a sad story, the outcome is not going to be good; but you are gripped and enthralled. There are some weird concepts which have you scratching your head — is the bevy of priests there because Orfeo sings “father” several times? Why the Pieta tableau? What is all that about? Rather mixed messages here, Christian and pre-Christian religious. I wish they’d not done that. But such exciting things happening around the UK capital for opera. It sure is a lively art form! 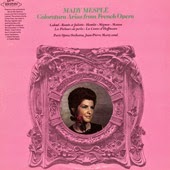 The archetype of the light French coloratura soprano, Mady Mesplé was noted for her technical security, her musical refinement and her charming stage presence. Her voice was particularly recognisable for its quick vibrato, intensely focused intonation, the instrumental-like quality of her runs and an amazing upper register extending easily to high A-flat. We are delighted to learn Mme Meplé is still with us at 83 (using Wikipedia's birth date), teaching and adjudicating. Notice how she makes everything look and sound easy, like breathing to her. I wish we had more of that today. On Friday 2nd January 2015 I went to see Un Ballo in Maschera at the Royal Opera House. Sitting high up and on the side (so that one can afford to go more often and it is not a once in ten years treat), you are very aware that the design has been created for those sitting centrally and lower down. The singers mostly stayed centre stage, so you could see most of what was happening. I wish we didn’t have a mise en scene over the overture--it leaves so many questions unanswered. Isn’t the music glorious enough for us to listen to without distractions? I didn’t get a programme. 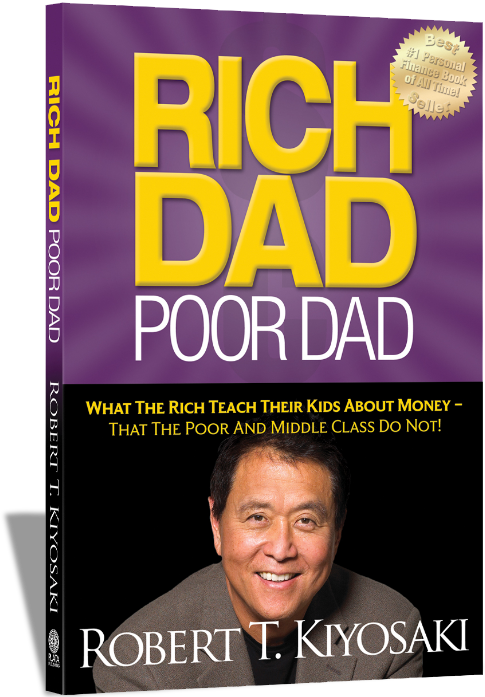 I have too many of them stashed away, and there is so much rich material included that you need a few days to read and assimilate it. So I prefer to take the show on face value, rather than find out later what the director’s intention was. 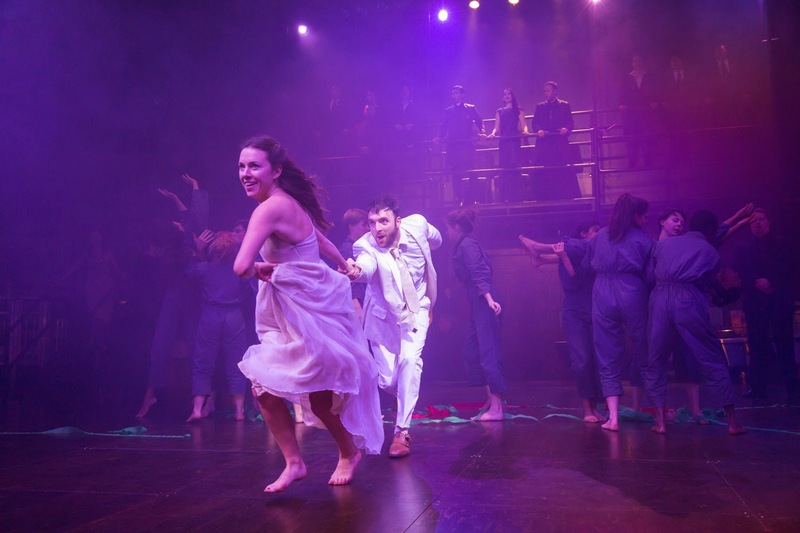 This production has had poor reviews, as is the case with so many updated productions when the director’s desire to “make a statement” takes over from the piece itself. Ballo had to have its historical location changed even before its first performance could go ahead, for political reasons, so it is quite reasonable to change it again, if it works. This production is set in the second half of the 19th century. The fortune-teller Ulrica is holding a séance in a society house, and the only person in 18th century clothes is Oscar. Why? For the most part, the story and the opera do work in this revised setting. The singing was good: Renato (Dmitri Hvorostovsky) a loyal and stern courtier (perhaps too stiff); Amelia (Liudmila Monatyrska), wracked with guilt as a matron who has been struck with a coup de foudre over Riccardo; and Riccardo himself (Joseph Calleja), a weak ruler, who believes his good intentions will overcome the hatred his previous actions have inspired. Oscar and Ulrica (Serena Gamberoni and Marianne Cornetti) deservedly got the loudest applause at the end. The other soloists and the chorus were great. (I wish they’d stayed a bit more with the orchestra.) I’m not sure that any passions were really expressed through the acting--it was all a bit stiff--but then I was sitting a long way away. There were some risible moments, such as Riccardo under the table at the séance, raising the tablecloth to sing his asides; and in the gallows scene, when the child walked across the stage as Amelia (according to the surtitles) was singing that something had crossed her path. Oh dear. The original production was scheduled to premiere for the carnival in 1858. What a shame then, that there was no carnival feel about this production--colours were dull and masks were hardly visible. I’m not sure I’d have terribly wanted to go to that ball, even without its disastrous outcome. And where was the menace as the conspirators closed in on their prey? Riccardo and Amelia are singing together on their own and on comes Renato with a gun and Bang!, the man is down. He is laid on one of the tombs which are conveniently rolled on, sings his final piece propped up on an elbow then flops down (again with a bang, but fortunately no sniggering from the audience). Ultimately, however, it really was a satisfactory and worthwhile evening; despite everything, you are reminded that a 150 year old opera like this can be very enjoyable. 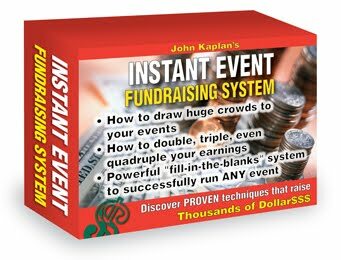 Perhaps the message is, don’t strain too much to make too many new statements, and do try to ensure the principals are truly engaged and fired up, inspired, themselves, and so, inspiring the audience. Jennifer Rowley and "Healthy Body, Healthy Voice"
Readers of this blog will not be surprised to read another expression of love and adoration for the beautiful soprano Jennifer Rowley. From her surprise debut at Caramoor several years ago to her more recent Metropolitan Opera debut, I've been following Miss Rowley's career closely. 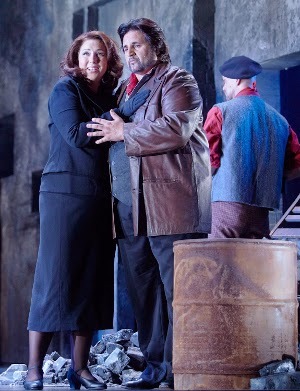 Making both her Australian and role debut[s] as Leonora, soprano Jennifer Rowley is large in voice and expressive in range, displaying natural vibrancy and controlled phrasing. Opening with pensive yearning in “Tacea la notte placida”, then frolicking with mature, seductive playfulness as she undresses to “Di tale amor”, Rowley's Leonora continues to feed every aspect of the drama with heartfelt conviction. Alas, I probably won't be able to travel to Dresden to see her first Tosca in April, or London to see her Covent Garden debut as Musetta in May/June. However, I will be able to be among the audience for Jen's first webinar, as part of the Sexi Soprano collective, on the subject of "Healthy Body, Healthy Voice". Click the link to find the details. I'll write more about it after the fact. What a delight to attend The Metropolitan Opera's gala opening of The Merry Widow on New Years Eve! Broadway star director Susan Stroman's new production, with English version by Jeremy Sams (of The Enchanted Isle infamy), had comedy, romance, and fun. Franz Lehár's rich harmonies and luscious melodies were beautifully spun by a very capable cast and The Metropolitan Opera's world-class orchestra and chorus, under the experienced baton of Sir Andrew Davis.